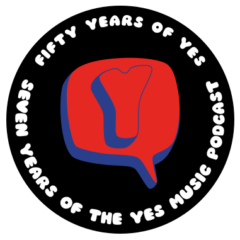 The twentieth episode of the Yes Music Podcast featuring the nineteenth studio album, ‘Magnification’. Does replacing the keyboard player with an entire orchestra work? Is the album progressive rock or cinematic rock? Are there any classic Yes moments? Hello Kevin another masterpiece well done A Gilded Lilly…perfect. Thanks once again, Paul. It’s lovely to hear you are still enjoying the episodes. I also saw the Magnification tour in Birmingham, UK, which I really enjoyed. As your say, it’s fantastic to have so many versions of Yes to appreciate – so many facets in the different line-ups and albums! I look forward to what you think of the last studio album episode next week! Hi Kevin. Well I think you were a little harsh about Magnification in parts, but there you go 🙂 I felt it was a bold move for the band to try a project like this, which made it truly progressive! Give Love Each Day and Dreamtime are standout tracks for me. I really enjoyed Larry Groupe’s orchestrations – big powerful stuff that not only obliterated the need for keyboards, but also made a lot of the guitar obsolete (eg. Spirit of Survival). In fact the competition between guitar and orchestra reminds me a bit of the Steve-Rick niggly thing on Tormato..
Not to take anything away from Larry Groupe’s work, but it always puzzled me why Yes didn’t reach out to two crazily-talented orchestral arrangers already within their own ranks, ie. Trevor Rabin or Rick Wakeman! Thanks for the comment, Ben. I agree it was a bold move! As for the orchestra making the guitar obsolete, I’m not sure I’m happy with that – on a Yes album! I would also have loved to hear what Rabin or Wakeman could have done with the orchestrations but I think it came down, as usual, to politics/timing!